We’d love your help. 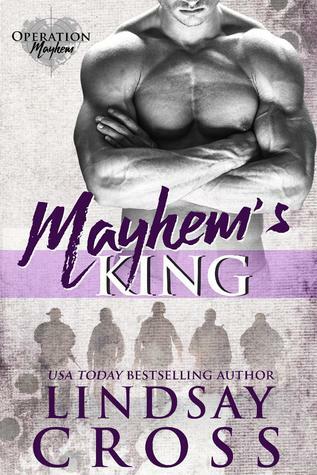 Let us know what’s wrong with this preview of Mayhem's King by Lindsay Cross. They only know him as the King of mayhem. The elite of the elite. The man his team relied on to save the unsaveable. Kingston Kenrich could save anyone…except those who he’d loved most. King thought he’d survived the worst, until his own teammate’s betrayal left him blind in one eye. Before, he lived for pain, now he li They call him the quiet one. To ask other readers questions about Mayhem's King, please sign up. An avid reader since childhood, reading and writing is in her blood. After y Lindsay Cross is the award-winning author of the Men of Mercy series. She is the fun loving mom of two beautiful daughters and one precocious Great Dane. Lindsay is happily married to the man of her dreams – a soldier and veteran. During one of her husband’s deployments from home, writing became her escape and motivation.